Participants in the International Stone Course engaged in plant removal and documentation at the historic Non-Catholic Cemetery in Rome. Photo: Benjamin Marcus, GCI. In June 2013 the Eighteenth International Course on Stone Conservation concluded in Rome. The twelve-week course—presented by the GCI in partnership with ICCROM and Rome's Non-Catholic Cemetery—brought together conservators, architects, conservation scientists, engineers, and archaeologists from nineteen countries to learn about theoretical and practical methodologies for stone conservation. This is the third time that the GCI has partnered with ICCROM on the course. Using ICCROM's facilities, and taking advantage of Rome's architectural heritage and its legacy of conservation practice, the participants learned about all aspects of stone conservation, including the history and theory of conservation, material characteristics of stone, deterioration mechanisms and methods of survey and analysis, and conservation interventions and criteria for treatments. 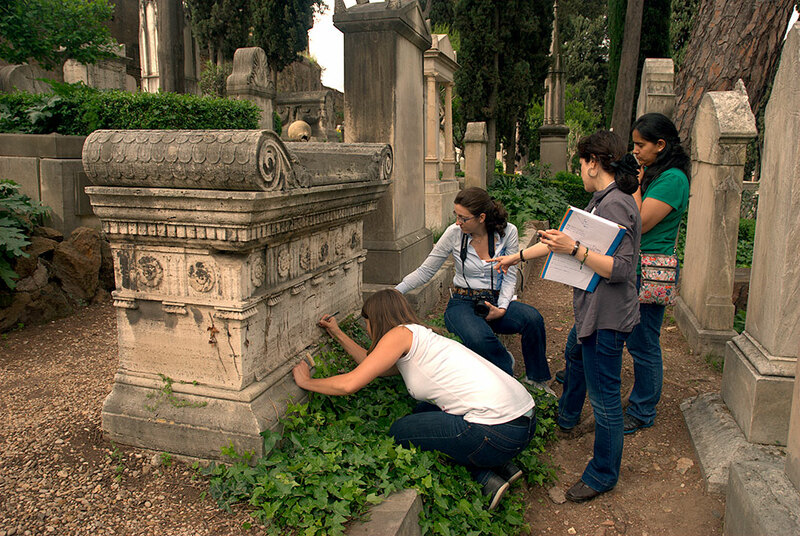 A fieldwork practicum at Rome's Non-Catholic Cemetery, along with a study tour of conservation projects in Florence, Carrara, Parma, and Venice, offered opportunities to learn hands-on conservation techniques and best practice. Building on the experiences of the previous courses, the 2013 course addressed the evolving needs of conservation professionals and provided them with a platform for exchanging ideas about conservation practices. Based on course evaluations, the curriculum will be refined to reflect the latest advances in stone conservation practice. The next International Course on Stone Conservation is planned for spring 2015.